now this really only needs the borders! The pattern is called Hanging Gardens (cannot remember the designer). Fabric line is Sanctuary by 3 Sisters for Moda. 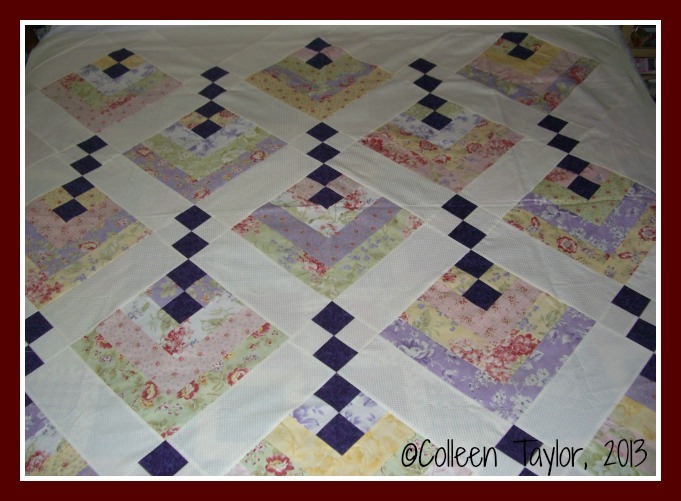 The border in the pattern is a Seminole pieced border. 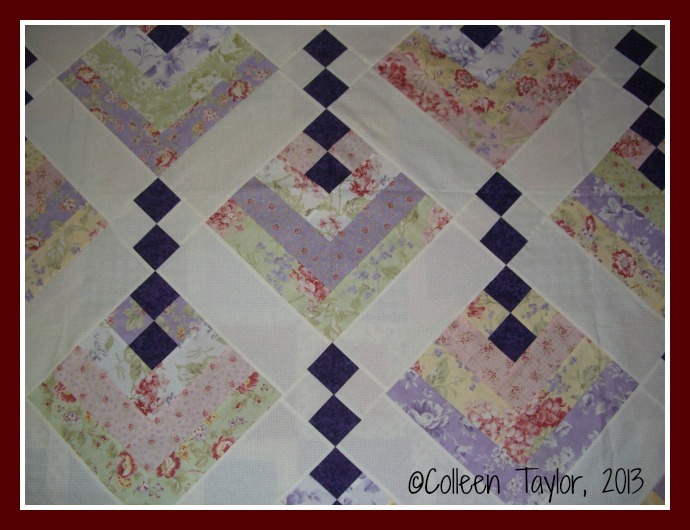 of the jelly roll that was not used in the top. Last week I went to a baby shower. 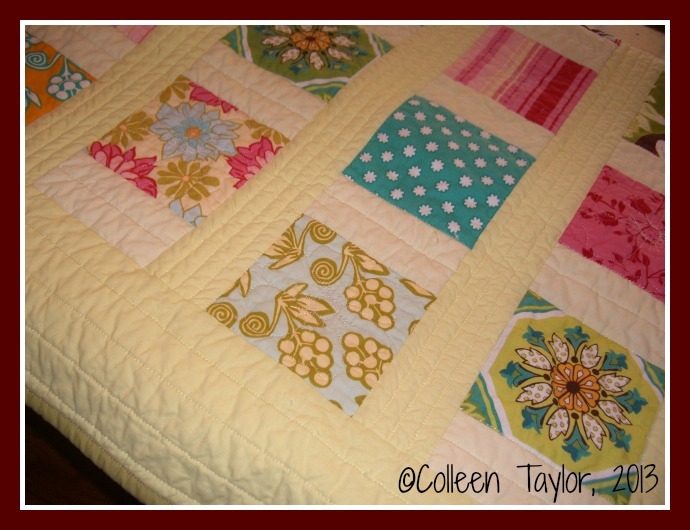 My niece loved the quilt I made for her new little girl to come...very soon! It was recommended by two of the instructors at NEQF to wash gift quilts prior to giving them. I did and was very pleased with the look of it! Sorry these photos do not show off my free motion flowers! They came out great and I was super happy with the final results! 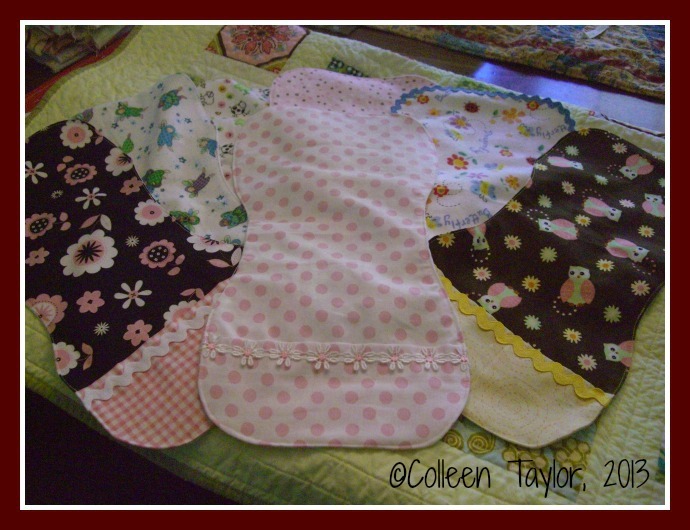 I also made some burp cloths...I call them Burpies! Sew much fun to make and add little touches to them. 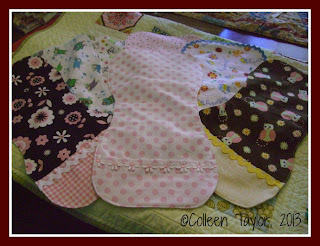 My favorites are the pink polka dots and the black with the pink flowers! In addition to the UFO that I started to work on again, this was a week of pulling out fabrics I think I might never use and making pillow cases for my house. I don't know why but there never seems to be enough of them. So far I have made 3 pair. Hope your Mother's Day was Sew nice! Thank you all for you lovely comments. Actually, Hanging Gardens may need to take a back seat. 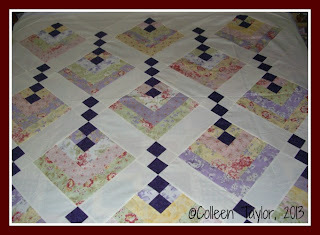 I have a wedding this summer and need to start on the quilt for that immediately! What a fun day you had. Love your Hanging Gardens quilt! Those are beautiful. I'm not sure I've seen Hanging Gardens before. Hmm. surely I need another UFO. I wash baby quilts too--and tell the parents to let the kid do whatever on the quilt. It's not a museum piece. Wow! They are all great! I hope you post a pic of the Hanging Gardens quilt when it's all done so that we can all admire it one more time. I love the hanging basket quilt. The pattern is striking with the colors you chose. 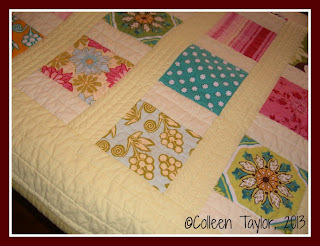 The baby quilt is very pretty as well. Great job on both. 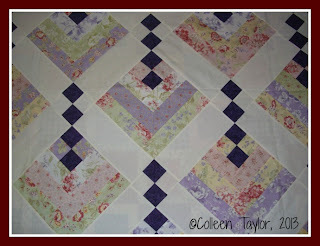 I love the "Hanging Gardens" quilt! I may have to break down and make one myself. I have seen the pattern somewhere (Hancock's? ), but don't remember the designer either. 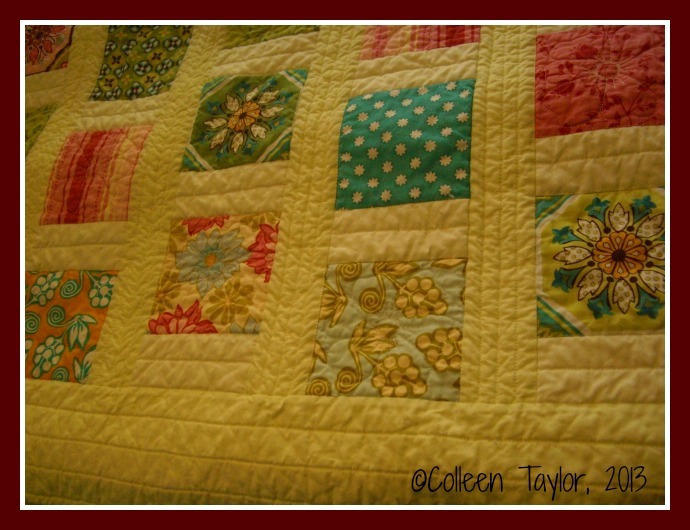 It's a great idea to wash a gift quilt, especially if it's a baby quilt! It gives it that delightful antique puckery look and you can demonstrate to the mother that washing will not hurt it! You're so lucky, you got to sew on Mother's day. And those quilts are so gorgeous! That was my intention, but got derailed because we had to go visit MIL, she's 94 and housebound so we drove over to say hi; SIL's husband made some lasagna, so I didn't have to do any cooking, just brought some store-bought fig squares which MIL loved. I did take a nap when we got home though.